"FDOTUS" redirects here. For First Daughter of the United States, see First Family of the United States. "First dog" redirects here. For the origin of the domestic dog, see corresponding article. United States presidents have often kept pets while in office, or pets have been part of their families. Pets also featured on presidential elections. 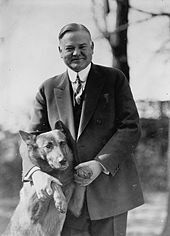 Herbert Hoover got a "Belgian Police Dog" (Belgian Malinois), King Tut, during his campaign and pictures of him with his new dog were sent all across the United States. 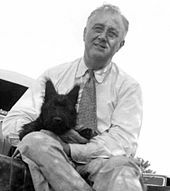 In 1944 Franklin D. Roosevelt was running for his fourth term when rumors surfaced that his Scottish Terrier, Fala, had accidentally been left behind when visiting the Aleutian Islands. After allegedly sending back ships to rescue his dog, Roosevelt was ridiculed and accused of spending thousands of taxpayers' dollars to retrieve his dog. At a speech following this Roosevelt said, "you can criticize me, my wife and my family, but you can't criticize my little dog. He's Scotch and all these allegations about spending all this money have just made his little soul furious." What was later called the "Fala speech" reportedly helped secure reelection for Roosevelt. Richard Nixon was accused of hiding a secret slush fund during his candidacy for vice president under Dwight D. Eisenhower in 1952. He gave the televised "Checkers speech" named after his cocker spaniel, denying he had a slush fund but admitting, "there is one thing that I did get as a gift that I'm not going to give back." The gift was a black-and-white cocker spaniel, Checkers, given to his daughters. Although there had been talk of Nixon being dropped from the ticket, following his speech he received an increase in support and Mamie Eisenhower reportedly recommended he stay because he was "such a warm person." Animal lovers were upset when President Lyndon B. Johnson was photographed picking his two beagles, named Him and Her, up by their ears. Others did not understand the uproar; former President Harry S. Truman said, "What the hell are the critics complaining about; that's how you handle hounds." In addition to traditional pets, this list includes some animals normally considered livestock or working animals that have a close association with presidents or their families. Presidents have often been given exotic animals from foreign dignitaries; occasionally these are kept, but often they are promptly donated to a zoo. Snipe[b] – Parrot[key 3] Said to have been owned by First Lady Martha Washington. Silkworms[key 1] – First Lady Louisa Adams spun their silk. An alligator – Said to have belonged to Marquis de Lafayette and housed for two months in the East Room,[c][d] Although this story has been widely circulated, the lack of evidence from contemporary accounts or official records suggests an apocryphal myth. Bolivia, Emily, Lady Nashville, Sam Patch, and Truxton – Horses[key 2] Sam Patch was named after the famous daredevil known as "The Yankee Leaper"
Two birds from Japan,[key 4][key 3] which had just opened its trading posts to the United States. Tabby and Dixie – cats. Lincoln once remarked that Dixie "is smarter than my whole cabinet." Butcher Boy, Cincinnati, Egypt, Jeff Davis (his wartime mount), Jennie, Julia, Mary, and St. Louis – Horses. [key 2] Cincinnati was a thoroughbred of renowned pedigree: son of Lexington, grandson of Boston. Mr. Reciprocity and Mr. Protection – opossums, named from the 1896 Republican party platform, which includes: "Protection and reciprocity are twin measures of Republican policy and go hand in hand." Washington Post – Yellow-headed Mexican parrot; could whistle "Yankee Doodle"
Bill the Lizard – lizard,[key 3] brought from California and described as a "horned frog" (cf. horned toad); likely named after Lewis Carroll's Bill the Lizard. Emily Spinach – garter snake,[key 3] so named by Roosevelt's daughter Alice because "it was as green as spinach and as thin as my Aunt Emily"
Peter Rabbit – Rabbit;[key 3] was given a "proper state" funeral Cf. Peter Rabbit. Pete – Bull Terrier, exiled to Long Island "after chomping on one too many legs"
Tom Quartz and Slippers – Cats[key 2], Tom Quartz was named after a cat in a Mark Twain story. Ducks – JFK's daughter, five-year-old Caroline raised ducklings at the White House. Ongoing conflicts with their terrier Charlie prompted sending them to Rock Creek Park. Rex (December 16, 1984–August 31, 1998) – Cavalier King Charles Spaniel. Millie (January 12, 1985–May 19, 1997) – Springer Spaniel. Socks (1989–February 20, 2009) – The Clintons' cat. 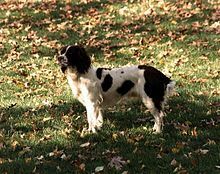 Spot "Spotty" Fetcher (March 17, 1989–February 21, 2004) – female English Springer Spaniel named after Scott Fletcher; Puppy of Millie; Euthanized after suffering a series of strokes. Barney (September 30, 2000–February 1, 2013) – Scottish Terrier. 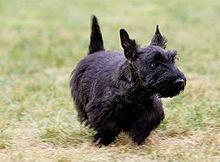 Miss Beazley (October 28, 2004–May 17, 2014) – Scottish Terrier; Nicknamed "Beazley Weazley"; 2005 birthday gift from George to his wife. Bo (born October 9, 2008) – Portuguese Water Dog. Sunny (born June 11, 2012) – Portuguese Water Dog. 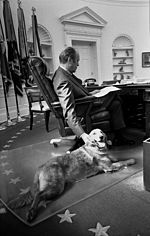 Wikimedia Commons has media related to Pets of presidents of the United States. ^ Some sources reference the name "Polly"
^ Number uncertain, perhaps received as many as seven. "Pierce was thought to have kept one dog, and he gave the other to his Secretary of War, Jefferson Davis. Davis was particularly pleased with the dog and was known to have carried it with him in his pocket." 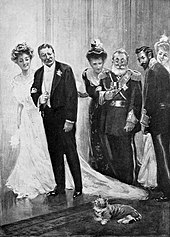 ^ Illustration from St. Nicholas (1908); original caption: "With an amused bow, the President escorted the Ambassadress around 'Slippers' and kept on his way toward the East Room." ^ "Presidential Pet Museum". Presidential Pet Museum. Archived from the original on April 10, 2001. Retrieved June 16, 2011. ^ a b c d "The First Family's Pets". The Herbert Hoover Presidential Library and Museum. National Archives and Records Administration. May 8, 2017. Retrieved December 21, 2018. ^ "1944 Radio News, 1944-09-23 FDR Teamsters Union Address – Fala (27:45–30:08)". Internet Archive. Retrieved July 14, 2015. ^ "Fala, the dog who helped win a presidential election". National Constitution Center. September 23, 2017. Retrieved November 17, 2017. ^ a b Anne Emig (Summer 2004). "Presidential pets of the past". K-State Perspective. K-state.edu. Archived from the original on December 12, 2012. Retrieved June 16, 2011. ^ Ethan Trex. "mental_floss Blog » The Bizarre History of White House Pets". Mentalfloss.com. Archived from the original on June 15, 2011. Retrieved June 16, 2011. ^ a b c d e f g h i j k l m n o p q r s Pamela Redmond Satran (November 5, 2012). "Do You Have a Dog in This Election? Pets Are Presidential". U.S. News & World Report. Retrieved June 19, 2013. ^ "Soldier, Statesman, Dog-Lover: George Washington's Pups". George Washington's Mount Vernon. ^ "American Foxhound History & Training/Temperament". American Kennel Club. Retrieved August 27, 2017. ^ "Dogs". George Washington's Mount Vernon. Mount Vernon Ladies' Association. Retrieved February 1, 2018. ^ a b c d e f g h i j k l m n o p q r s t u v w x y z aa ab ac ad ae af ag ah Choron, 20. ^ Mary V. Thompson. "Donkeys". George Washington's Mount Vernon. Mount Vernon Ladies' Association. Retrieved February 1, 2018. ^ Mary Brigid Barrett. "Presidential Menageries: Washington's Mules and Hounds". Our White House. The National Children's Book and Literacy Alliance. Retrieved August 5, 2017. ^ "Nelson (Horse)". George Washington's Mount Vernon. ^ a b c d e "Spring 1999: Presidential Pets". Inside the White House. nara.gov. Retrieved December 21, 2012. ^ a b c d Doering, Laura (February 14, 2013). "Presidents & Their Pet Parrots". Pet Birds by Lafeber Co. Lafeber. Retrieved January 25, 2018. ^ Wolf, Alissa. "First Pets: A History of Critters in the White House". About.com. Retrieved October 2, 2012. ^ a b Calkhoven, Laurie (2007). George Washington: An American Life. Edison, NJ: Sterling Publishing Company, Inc. p. 91. ISBN 9781402735462. ^ a b c "White House Pets (1789–1850) – Presidential Pet Museum". Retrieved September 10, 2016. ^ "Mockingbirds". Thomas Jefferson's Monticello. Thomas Jefferson Foundation. Retrieved January 25, 2018. ^ "Dogs". Thomas Jefferson's Monticello. Thomas Jefferson Foundation. Retrieved January 25, 2018. ^ "Grizzly Bears". Thomas Jefferson's Monticello. Thomas Jefferson Foundation. Retrieved January 25, 2018. ^ "Caractacus". Thomas Jefferson's Monticello. Thomas Jefferson Foundation. ^ "James Monroe Biography – Presidential Pet Museum". Presidential Pet Museum. Retrieved August 5, 2017. ^ The Handy Science Answer Book. Visible Ink Press. 2011. Retrieved December 22, 2012. ^ "Louisa Adams Biography ::". www.firstladies.org. National First Ladies' Library. ^ a b Lang, Heather. "Lions and Tigers and Bears, Oh My! Animals at the White House". Our White House. National Children's Book and Literacy Alliance. Retrieved January 3, 2018. ^ Whitcomb, John; Whitcomb, Claire (2002). Real Life at the White House: Two Hundred Years of Daily Life at America's Most Famous Residence. Psychology Press. p. 52. ISBN 9780415939515. ^ Truman, Margaret (2016). White House Pets. New Word City. p. 5. ISBN 9781612309392. ^ Hager, Andrew (February 21, 2018). "Bitten by an Alligator". Presidential Pet Museum. Retrieved December 21, 2018. ^ Dorre, Howard (February 19, 2018). "John Quincy Adams's Pet Alligator Was A Crock". Plodding through the Presidents. Retrieved December 21, 2018. ^ a b c Longley, Robert (June 29, 2017). "First Pets: Animals in the White House". ThoughtCo. Retrieved July 11, 2017. ^ The Handy Science Answer Book. Visible Ink Press. 2011. Retrieved October 3, 2015. ^ "Apollo, Zachary Taylor's Pony". Presidential Pet Museum. January 6, 2014. Retrieved December 19, 2018. ^ a b Kate Kelly (August 5, 2015). "Teacup Dogs Owned by President Franklin Pierce". America Comes Alive. Retrieved August 27, 2017. ^ King, Gilbert. "The History of Pardoning Turkeys Began With Tad Lincoln". Smithsonian. Retrieved January 26, 2018. ^ Ackermann, Ann Marie (July 11, 2017). "Lincoln's dog Fido: A Faithful Pet Assassinated Like His Master". www.annmarieackermann.com. Retrieved May 16, 2018. ^ McClarey, Donald R. (January 30, 2011). "Lincoln's Dog Fido". The American Catholic. Retrieved May 16, 2018. ^ Coren, Stanley (October 12, 2011). "Why Are Dogs So Frequently Called "Fido"?". Psychology Today. Canine Corner: Sussex Publishers. Retrieved May 16, 2018. ^ "Where Does the Dog Name Fido Come From?". American Kennel Club. January 1, 2009. Retrieved May 16, 2018. ^ "Ulysses S. Grant and His Horses During and After the Civil War". The Ulysses S. Grant Information Center. College of St. Scholastica. Archived from the original on July 19, 2011. Retrieved August 13, 2018. 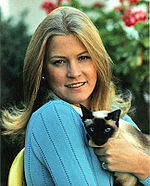 ^ Sickles letter about Siamese cat. Rutherford B. Hayes Presidential Center. ^ Kate Kelly (July 13, 2016). "Grover Cleveland's Dogs and Other Pets". America Comes Alive. Retrieved August 5, 2017. ^ a b c "Pets in the White House". White House for Kids. nara.gov. Retrieved December 21, 2012. ^ Kelly, Kate (August 25, 2013). "The Pets in the Benjamin Harrison White House". America Comes Alive. Retrieved January 26, 2018. ^ Best, Jama A. "Opossums and the Presidency: A Tail of Intrigue and The White House" (PDF). UA Little Rock Center for Arkansas History and Culture. University of Arkansas. Retrieved May 11, 2018. ^ Cox, Ana Marie (August 20, 2013). "Top 10 presidential pets in US history". the Guardian. Opinion. Retrieved May 11, 2018. ^ "1896: The Republican Platform". projects.vassar.edu. Vassar College. Retrieved May 11, 2018. ^ San Francisco Chronicle. "Russell Harrison’s Alligator Didn't Influence His Friends' Luck." 9 May 1890. Via: "FACT CHECK: Were Alligators Ever Kept as White House Pets?". Snopes.com. Retrieved December 19, 2018. ^ Riis, Jacob A. 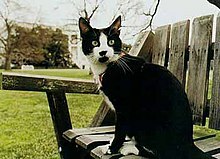 ""Slippers," The White House Cat" (pdf). archive.org. Vol. XXXV; January, 1908; No. 3: St. Nicholas. p. 203. ^ McClintock, J. N. (1904). New England Magazine: An Illustrated Monthly, Volume 29. Boston: America Company. p. 601. ^ Roosevelt, Theodore (June 21, 1904). "53. Bill the Lizard". www.bartleby.com. Theodore Roosevelt’s Letters to His Children. Retrieved December 18, 2018. ^ a b Roosevelt, Theodore (May 10, 1903). "20. More Treasures". www.bartleby.com. Theodore Roosevelt's Letters to His Children. Retrieved December 18, 2018. 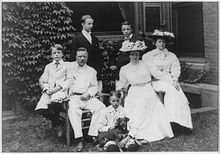 ^ "Why did Alice Roosevelt own a pet snake named Emily Spinach?". www.childrensmuseum.org. The Children's Museum of Indianapolis. Retrieved May 9, 2018. ^ Roosevelt, Theodore (1919). Bishop, Joseph B. (ed.). Letters to his children. New York: Charles Scribner's Sons. p. 19. ISBN 9781623769864. Retrieved February 4, 2018. ^ Thompson, Madeleine (September 15, 2015). "A Small Bear Named Jonathan Edwards". WCS Archives Blog. Wildlife Conservation Society. Retrieved February 4, 2018. ^ Tanner, Beccy (September 10, 2012). "Pet Kansas badger once roamed White House". Wichita Eagle. Retrieved February 3, 2018. ^ Roosevelt, Theodore (May 28, 1904). "49. Peter Rabbit's Funeral". www.bartleby.com. Theodore Roosevelt's Letters to His Children. ^ "Presidential Pets". CBS News. CBS Interactive Inc. October 4, 2016. Retrieved May 16, 2018. ^ "Roughing It, Part 7". www.gutenberg.org. Retrieved May 7, 2018. ^ "America's First Presidential Hyena". Ethiopianism-Ethiopiawinet Online Revival. November 14, 2012. Retrieved August 27, 2017. ^ "William Taft's Caruso". Presidential Pet Museum. Retrieved May 10, 2018. ^ a b c d Kelly, Kate (August 15, 2012). "The Pets of Woodrow Wilson (1856-1924)". America Comes Alive. Retrieved May 11, 2018. ^ "Why did President Woodrow Wilson keep a flock of sheep on the White House lawn?". White House Historical Association. Retrieved December 22, 2018. 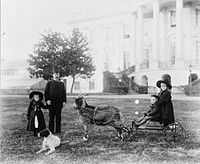 ^ "White House Pets in the Past". White House Historical Association. Gallery image description: 4 / 7. Retrieved December 20, 2018. ^ Betsy (July 1, 2013). "Pay a Call on Petey the Canary at Warren G. Harding's Marion Home". ^ a b c d e f g h i Pietrusza, David. ""Wombats and Such": Calvin and Grace Coolidge and Their Pets". www.davidpietrusza.com. Retrieved January 26, 2018. ^ a b c d e f g h i j Houghton, Leah. "The Coolidge Pets". coolidgefoundation.org. Calvin Coolidge Presidential Foundation. Retrieved January 26, 2018. ^ Patterson, Michael Robert. "Edmund William Starling, Sergeant, United States Army". www.arlingtoncemetery.net. Retrieved January 27, 2018. ^ a b Stephen Bauer, At Ease in the White House: Social Life as Seen by a Presidential Military Aide, Taylor Trade Publications, 2004. ISBN 1-58979-079-0. pp 224. ^ a b c Costello, Matthew (June 8, 2018). "Raccoons at the White House". The White House Historical Association. Retrieved December 19, 2018. ^ Roby, Marguerite (September 25, 2012). "Goody Goody Gumdrops". Smithsonian Institution Archives. Retrieved November 8, 2018. ^ Theis, Michael (May 16, 2013). "Hoover's Opossum Brings Luck to Hyattsville Baseball Team". Hyattsville, MD Patch. Patch Media. Retrieved December 24, 2018. ^ "HOOVER POSSUM PROMISED LADS". The Spokesman-Review. Spokane Wash. AP. July 16, 1929. p. 9. Retrieved December 24, 2018. ^ a b c d e f g h i j k l m n o p q r s t u v w x y z Sandra Choron, Planet Dog: A Doglopedia, Houghton Mifflin Harcourt, 2005, ISBN 0-618-51752-9. pp 21. ^ Amy Ruth, Herbert Hoover, Twenty-First Century Books, 2004, ISBN 0-8225-0821-4. pp 64. ^ Wayne Bryant Eldridge, Tom Kerr The Best Pet Name Book Ever!, Barron's Educational Series, 2003, ISBN 0-7641-2499-4. pp 29. 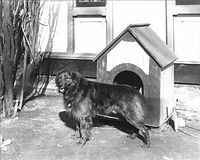 ^ "FDR's German Shepherd, Major". Presidential Pet Museum. March 5, 2016. Retrieved March 30, 2019. 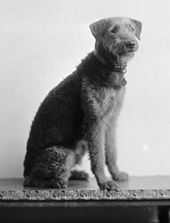 ^ "President Truman's Dog, Feller". Highland-ohio.com. January 12, 1948. Retrieved June 16, 2011. ^ West, Tracey. Hail to the chief! : fun facts and activities about the US presidents. New York. ISBN 9780399541469. OCLC 933567941. ^ "White House Pets". Eisenhower Presidential Library, Museum & Boyhood Home. ^ Sally Bedell Smith, Grace And Power, Random House, Inc., 2006, ISBN 0-345-48497-5, pp 219. 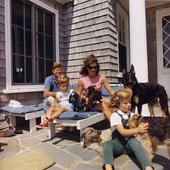 ^ a b c d e f "Pets – John F. Kennedy Presidential Library and Museum". Jfklibrary.org. December 3, 1961. Archived from the original on August 22, 2006. Retrieved June 16, 2011. ^ "Caroline Kennedy's Pet Ducks". White House Historical Society. Retrieved December 22, 2018. ^ "White House Christmas Cards & Messages from John F. Kennedy". Retrieved December 22, 2018. ^ Robert Knudsen. "KN-C30039. Kennedy Family with Pony, Leprechaun". White House Photographs. John F. Kennedy Presidential Library and Museum, Boston. Retrieved December 22, 2018. ^ Thomas, Nick (February 19, 2018). "A salute to the presidents' pets". NewsOK.com. The Oklahoman. Retrieved January 7, 2019. 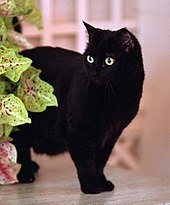 ^ "Lyndon B. Johnson's Pet Info". Exoticdogs.com. Retrieved June 16, 2011. ^ Tribune, Chicago. "Presidential pets". chicagotribune.com. ^ "Presidential Pooch – Grits, the Impeached First Dog | Bully Sticks". Bullysticksinfo.com. November 21, 2008. Archived from the original on July 8, 2011. Retrieved June 16, 2011. ^ Diego, Alpha (November 14, 2016). "Presidential Dogs: Past U.S. Presidents and Their Fur Babies". dogbreedsjournal.com. Dog Breeds Journal. Retrieved January 25, 2018. ^ "Ronald Reagan Presidential Library". Reagan.utexas.edu. Retrieved June 16, 2011. ^ a b c d e Stanley Coren, Why Does My Dog Act That Way?, Simon and Schuster, 2007, ISBN 0-7432-7707-4. pp 6. ^ a b c d e f Stanley Coren, Why We Love the Dogs We Do: How to Find the Dog That Matches Your Personality, Simon and Schuster, 2000, ISBN 0-684-85502-X. pp. 5. ^ Coren, Why Does my Dog..., 7. 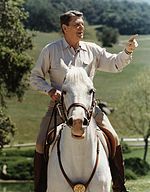 ^ "Ronald Reagan's Ranch Horses - Presidential Pet Museum". Presidential Pet Museum. Retrieved February 4, 2018. ^ "President Reagan, whose favorite horse died last month, rode..." UPI. Retrieved February 4, 2018. ^ "Ranch". Ronald Reagan Presidential Library - National Archives and Records Administration. Retrieved July 16, 2018. ^ a b Bailey, Holly (April 24, 2013). "Laura Bush: New library is not 'a monument' to her husband". Yahoo News. Retrieved April 24, 2013. ^ Barack Obama (August 19, 2013). "Meet the newest member of the Obama family: Sunny". Facebook. Retrieved August 19, 2013. ^ Hannah August (August 19, 2013). "Meet Sunny: The Obamas' New Puppy". The White House Blog. Archived from the original on August 20, 2013. Retrieved August 20, 2013. ^ Lucey, Catherine. "Breaking with tradition, Trumps have no plans to get 'first pet'". chicagotribune.com. Thomas, Nick (February 19, 2018). "A salute to presidential pets". The Oklahoman. This page was last edited on 14 April 2019, at 20:10 (UTC).